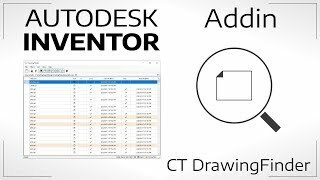 Easy tool to scan the assembly and check if its individual elements have drawings. The output list contains information about existing drawings and the last date of their modification. It is also possible to highlight files with different dates (compares local files and Autodesk® Vault® files). Important: The minimum version of Vault for DrawingFinder is 2019. Otherwise works only with local files.